One of my favorite things about Masters weekend is the yummy food we snack on while watching the rounds. If you attend you are able to be eating pimento cheese and egg salad sandwiches along with Arnold Palmers and peach ice cream sandwiches. Since we love all of those things in the Minear house and I try to have some fun little snacks on hand to give us all the feels of being there without actually being there. If you like to watch as much as we do ... I have some fun tips for you to be able to create some of the yummy eats you can get while you are there. I pull together a few things to give us all the Masters feels even though we aren't anywhere near those beautiful greens. 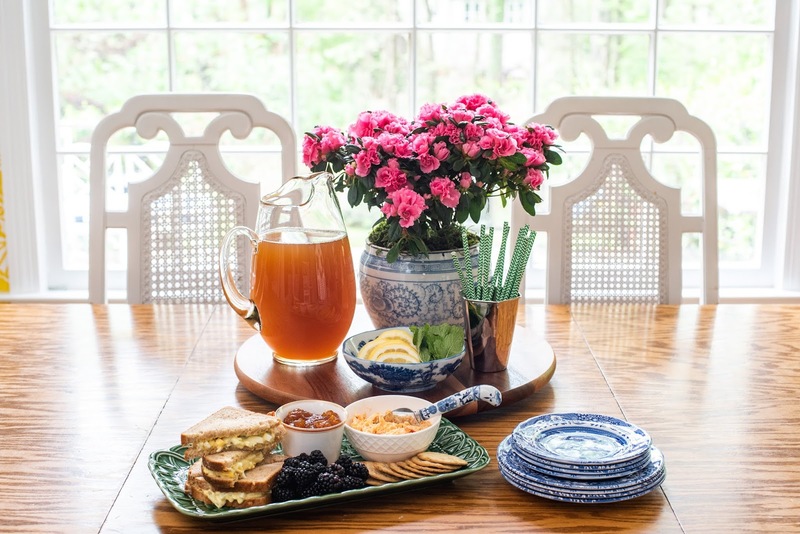 I put together a tiny spread with pimento cheese, egg salad + a few necessities. 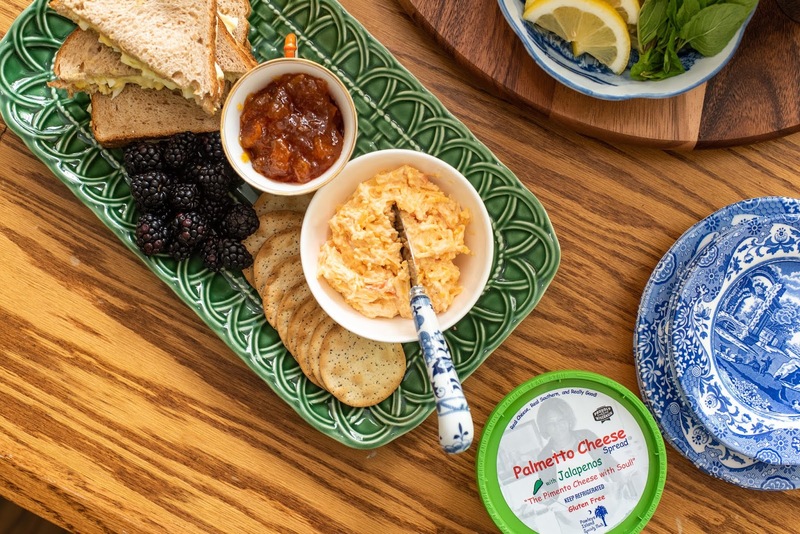 I prefer to serve my pimento cheese with crackers and jelly, my favorite being apricot. 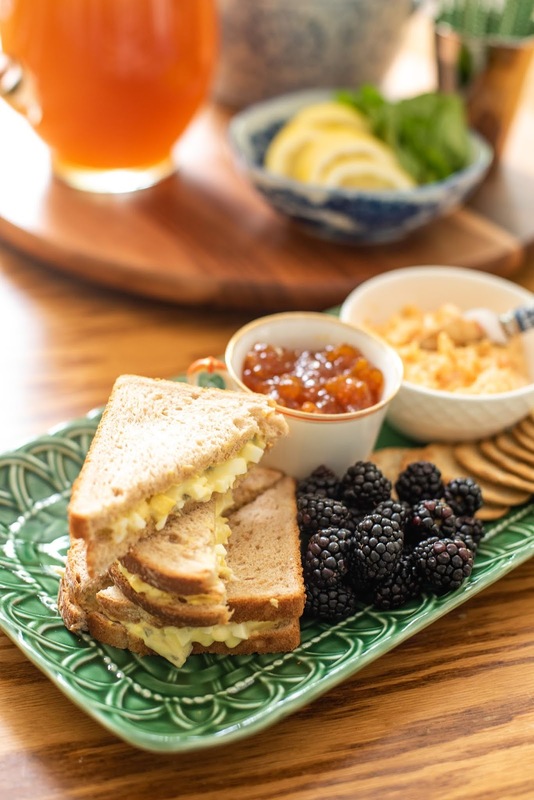 This year I made egg salad sandwiches, added in my favorite pimento cheese (plus crackers + jelly) and finished it off with some fresh blackberries. The tray of yummies is perfect for lunch or a pre-dinner snack for all of us. If we have company this set up is so easy to expand for more guests. You can either use a larger tray or use multiple trays and split up your bites by type. How fun would a large tray be with some fun Masters cookies mixed in? Why oh why didn't I think of that earlier? Of course to round out the yummy snack you need an Arnold Palmer or two. I love to pull out all my green to celebrate the weekend along with our vintage Masters glasses I found a while back in an antique shop. I love to pair the glasses with these darling golf napkins from Emily McCarthy and add in a green paper straw. 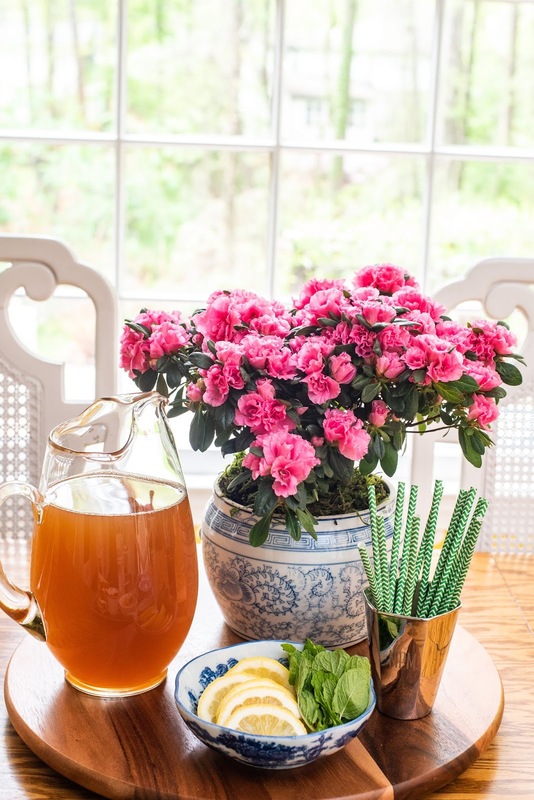 My favorite Arnold Palmer mix is made from Chick-fil-A sweet tea + Simply Orange Lemonade, I just add some mint + a slice of lemon and it's truly perfect. To take it up a notch you can make a John Daly just add in your favorite vodka and a splash of Orange Liqueur. Of course, my favorite vodka is Cathead Honeysuckle. It makes the perfect cocktail every single time. 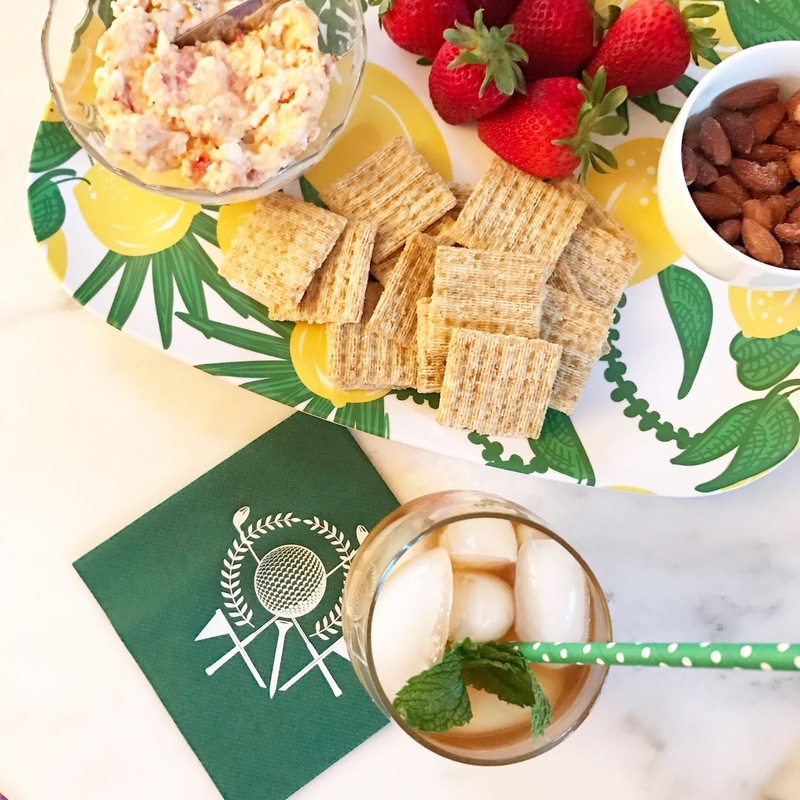 If you want to create a more authentic Masters experience I found some recipes to recreate the pimento cheese sandwiches they serve at the Augusta National Gold Club. This recipe is from Southern Soul BBQ in St. Simons which you must try if you are on the island. Their food is so good. 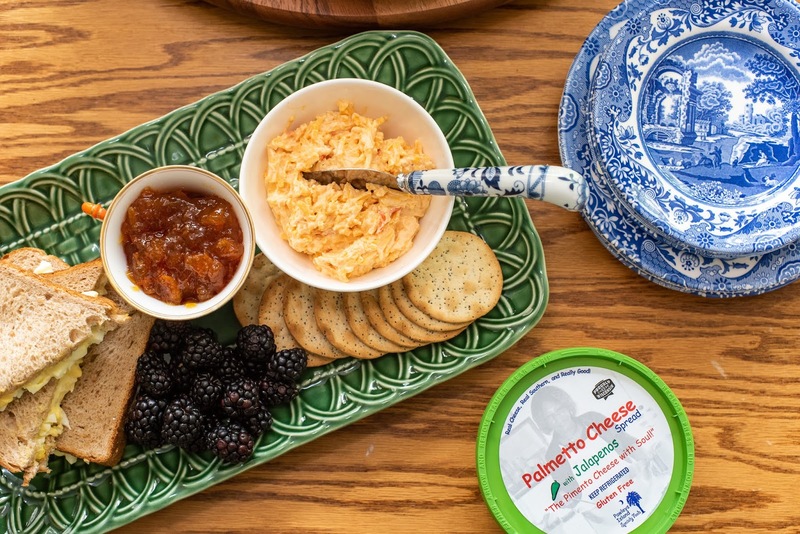 Personally I think there are so many amazing pimento cheese companies on the market if making your own isn't your thing. I like either Proper Pepper (Classic or Get Back Jack) or Palmetto Cheese (regular. bacon or jalapeno). The club serves this exact brand on white bread if you want to recreate it exactly. As you can see I chose Palmetto Cheese for the weekend and I grabbed both the regular and jalapeno for my crew. This year I am making frozen Arnold Palmers using a recipe I found on Callie's Biscuits blog. They look and sound absolutely amazing, I can't wait to try them. 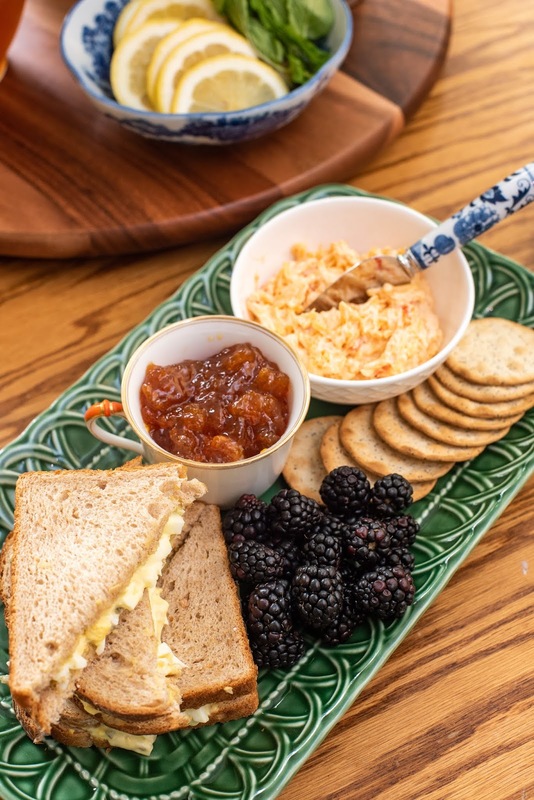 Callie's makes a fabulous pimento cheese that you can add to your biscuits, sandwiches or eat alone. It is available in both regular and fiery andI personally prefer the spicy one. When I was at the shop a few weeks ago for the biscuit class I grabbed some cheese crisps which I will be setting out as well. Just thinking of all the yummy snacks has me ready for Masters watching. Pass the plates and let's get this weekend started. 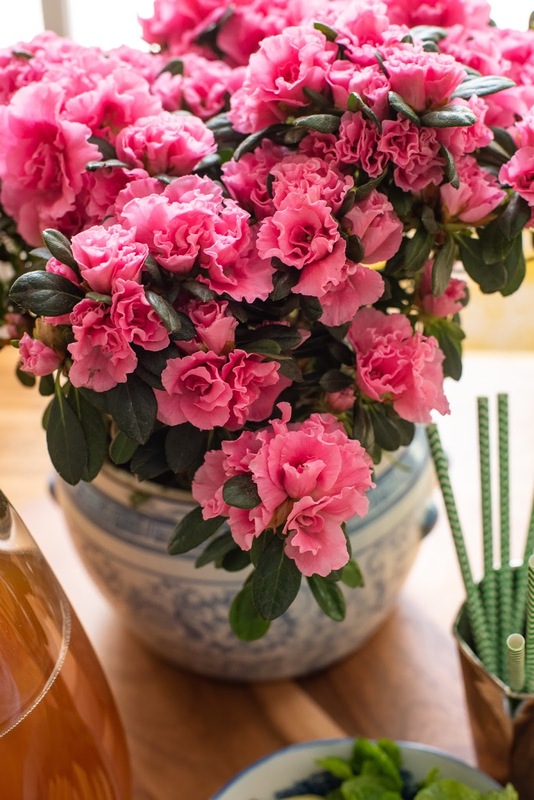 Oh, and how darling is this tiny azalea bush I found at the market? I can even plant it in the yard after it is finished blooming ... Yes please! I hope your Saturday is perfect, if you are looking for us we will be taking in all the golf and snacking on all the yummies! Have the best weekend! ,,,/,,,,,,,,and where is this shop called 'Callie's Biscuit' ? I live in Roswell.